Posted on January 31, 2019 at 5:43 pm. 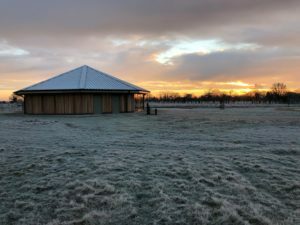 The new Cedar Hall was opened in October 2018 by Deb Jordan who with her husband owns Pensthorpe Natural Park; since then we have welcomed many families paying respects to their loved ones in our new purpose built building. Our intention since opening the Park in 2015 has always been to serve the needs of families at their time of loss. We have designed the ceremonial hall with this in mind canvassing the opinions of our team at the Park as well as local funeral directors; and having witnessed many funerals over the years, the families that visit the Park. Dedicated disabled car parking spaces. The team at Norfolk Bluebell Wood is here to serve your needs; so please contact us to arrange a visit to our calm, tranquil parkland setting situated just minutes from the A140.